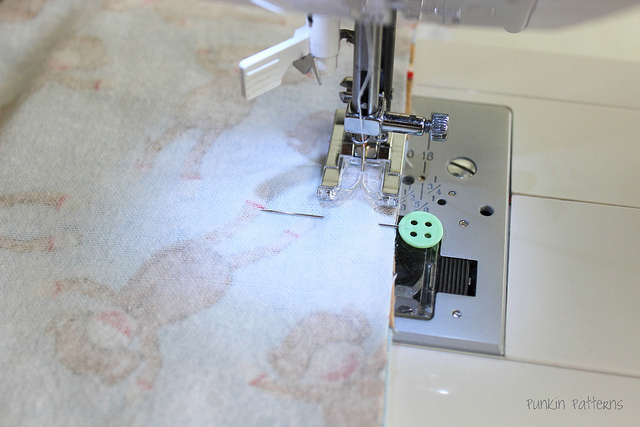 Sewing straight lines is crucial for making your projects look professional. It’s an important first step to master and it is much easier than you think. First off, let’s talk about what a seam allowance is. A seam allowance is the distance your pattern gives from the edge of your fabric to where the seam should be sewn. You should always follow the seam allowance recommended in the pattern or tutorial. Everything has been worked out to use that seam — especially when it comes to making clothes. This will ensure that you get the completed size you are supposed to and the project comes together well. Flat projects like quilts or napkins have a bit more wiggle room on this issue, but it is best, especially when first starting out, to use what is recommended. On the sole plate of your machine, there are seam guides right there. I took my machine’s foot off so you could see them better. Each machine is slightly different, but this is what mine looks like. 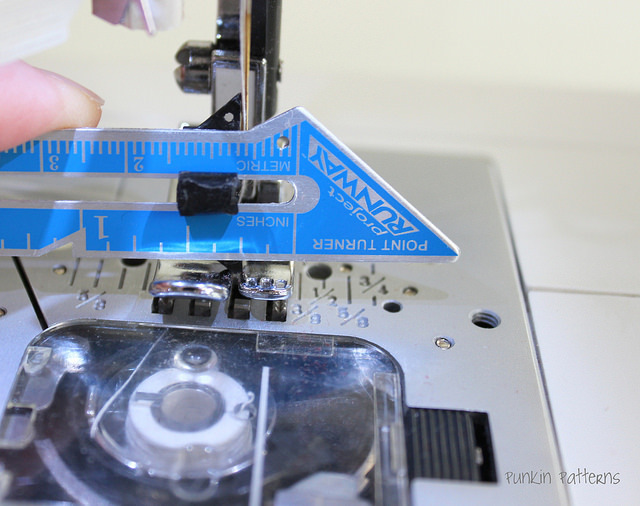 If the needle is in the center position, you can use these measurements as your guide. The most common seam allowances are 3/8″, 1/2″ and 5/8″. 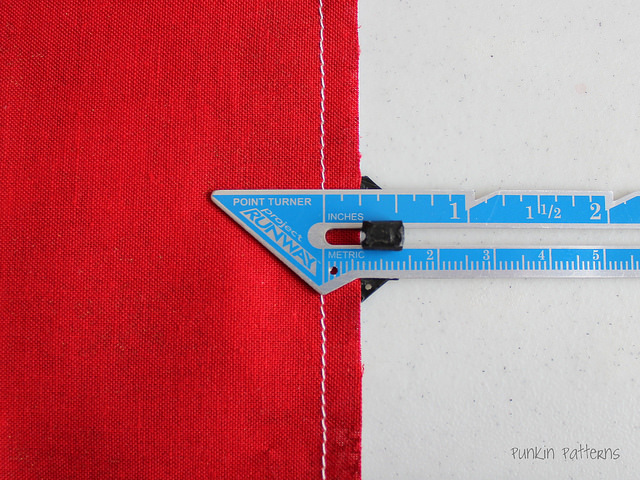 If you’re a quilter (or want to be), the 1/4″ seam is what you’ll use. You notice that a 1/4″ is not marked. We’ll get to that in a minute. The lines are on both sides of your machine, but typically you only use the guides on the right side of the foot (because otherwise your entire project would have to be shoved under the arm of the machine). 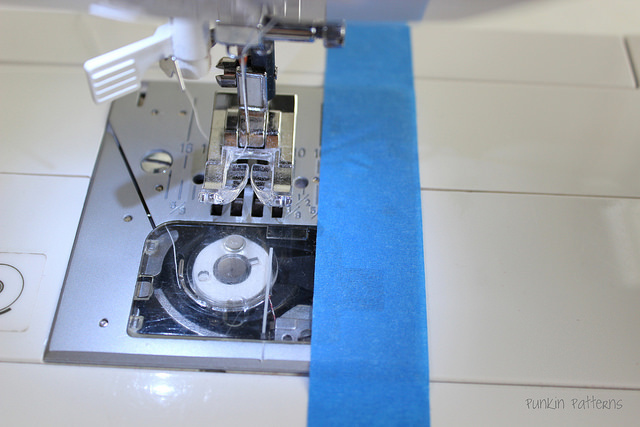 The basic sewing machine foot gives a 3/8″ seam when you align your edge of the fabric with the edge of the foot. You should still measure this once to double check that this is your machine’s standard. This is the easiest seam allowance to practice. Keep a gentle hold on the fabric as you sew. Don’t tug or pull on it. The feed dogs (the tiny moving teeth underneath the foot — for a review go here) move the fabric at the right pace for how fast you’re sewing. You don’t need to push the fabric or pull it. 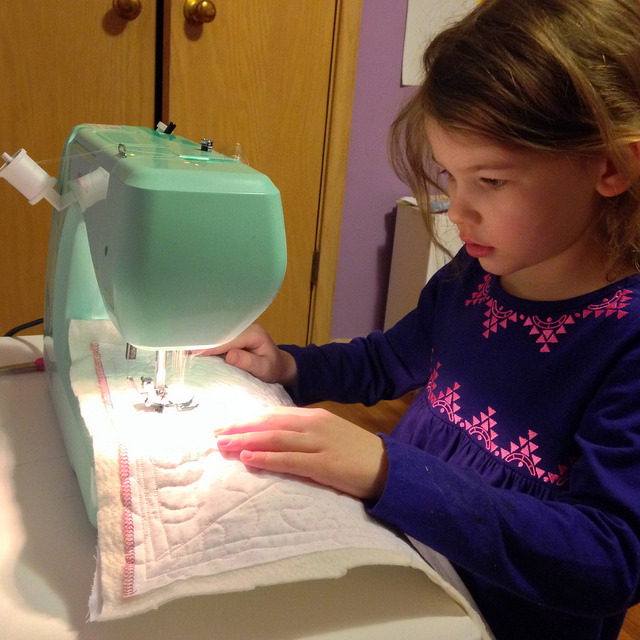 I’ve been teaching my six-year-old how sew. We say that we use our “butterfly hands” to guide the fabric — meaning we gently guide the fabric. Don’t hold it down or push to hard. Be as gentle as you would hold a butterfly (or at least how a six-year-old might). 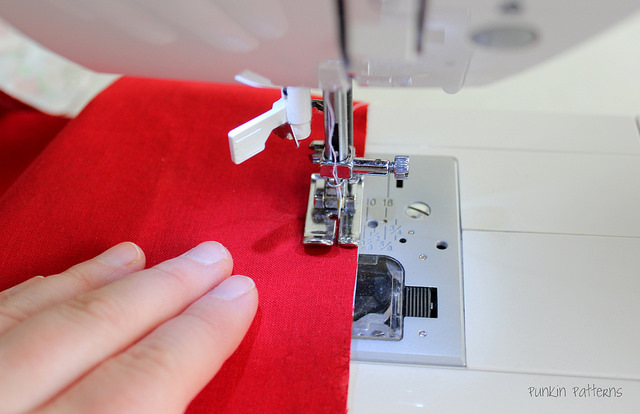 Moving your hands as you sew will come easily with practice. It won’t take much. Here’s my little one practicing her stitching using her “butterfly hands” on her first day of sewing on her own machine. Depending on the size of your project, the fabric itself can pull on the feed dogs – like if you’re making a quilt or even just a large garment. Keeping your workspace clean and open to the left side of the machine and letting the table help support your project can help. If your project is pulling at the feed dogs, you may need to help support it’s weight or use slightly more pressure to guide the fabric through at the right rate to correct for the pulling. If you’re not using the easy 3/8″ seam allowance, say you want a 5/8″ seam (most common seam for commercial grade garment patterns), there is a seam guide line on the sole plate for that. It is however, very small and can be hard to see as you sew. 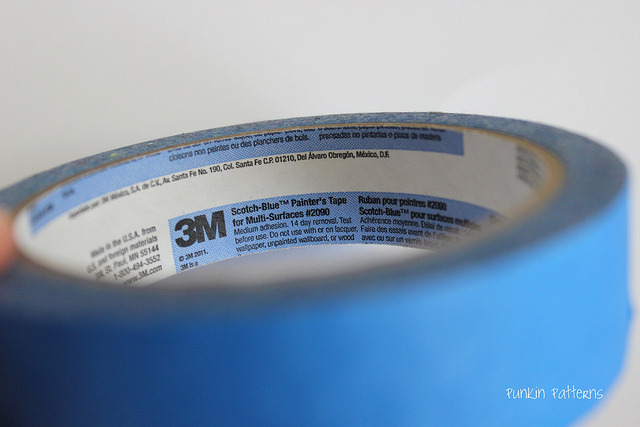 An easy fix is to use a bit of blue painters tape (low tack tape) and extend that line. You can place the tape directly onto the machine. If you use this kind, it leaves no residue behind. Just line it up with the seam line already there. You can make the new guide as long or as short as you like. 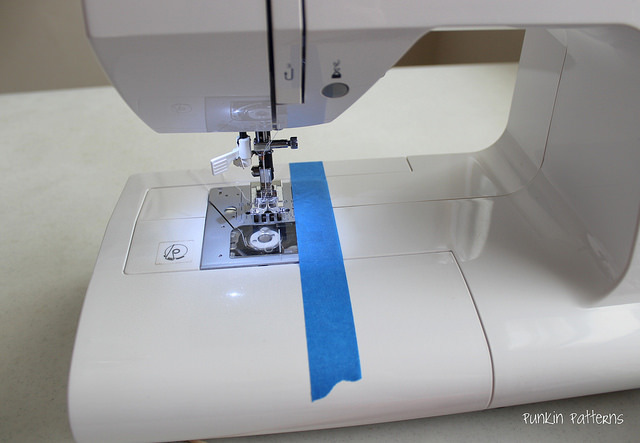 Use this blue line as the guide for the edge of your fabric as you sew. Simply remove the tape when you’re done. A quick note on sewing with pins: If you pin your project, make sure the pins are perpendicular to the raw edge (as below). They are easy to remove as you sew and some machines can sew right over them if they are like this. Check your manual to be sure of your machine’s recommendation on this. A 1/4″ seam is used for quilting. As mentioned before, there are no seam guides for this length. Why? well it’s shorter than the width of your standard foot. Remember that was 3/8″ to the edge of the foot from the center. 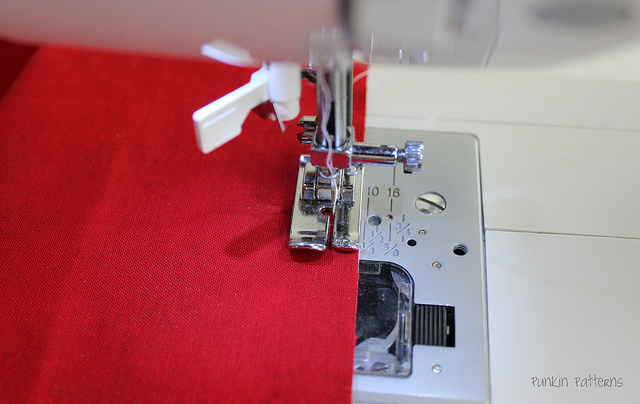 The simplest and most reliable way to get a 1/4″ seam is to use what’s called a 1/4″ foot. 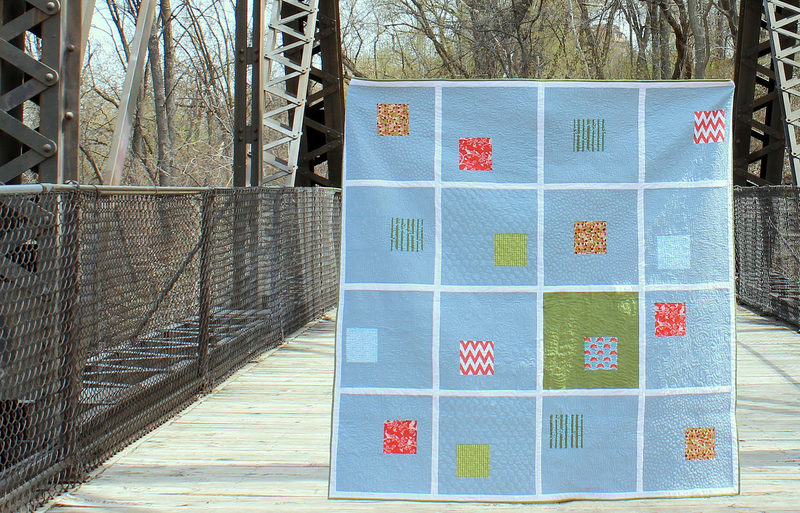 If you’re planning on making even one quilt, it is a worthy investment. This is what it looks like. Note that the right side is the 1/4″ side. 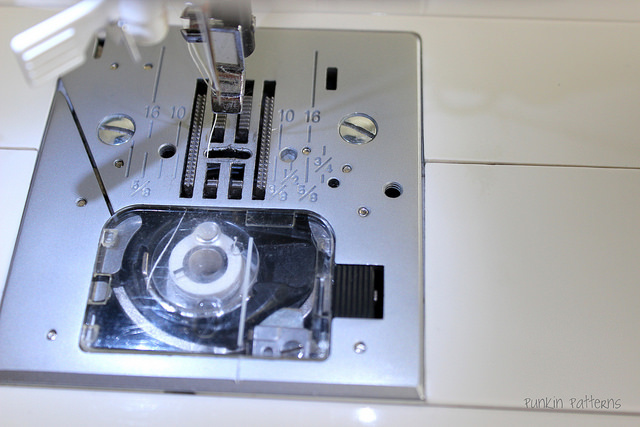 With most 1/4″ sewing machine feet, you’ll need to move the position of the needle to the right a bit. Move the needle and measure from the right side edge of the foot to the needle position. You can also test this on scrap fabric and measure it on the fabric itself. Note the position of the needle for future use. 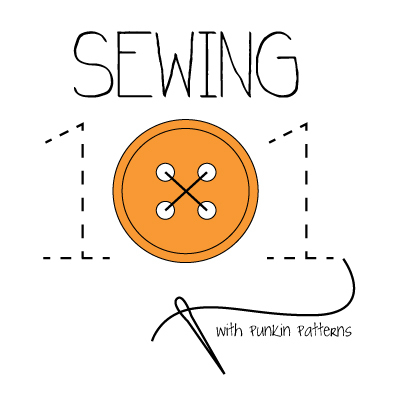 Now that you’ve got a good handle on how to sew a straight line it’s time to practice! Making cloth napkins is a great way to practice. 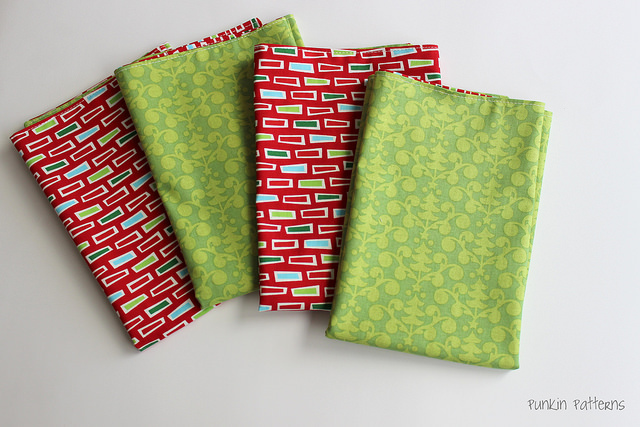 You can follow the tutorial here for complete instructions on making double sided napkins. 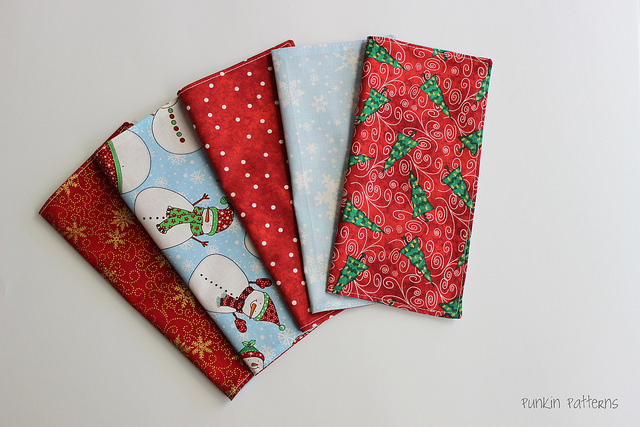 I whipped these festive holiday dinner napkins (and lunch sized napkins) up the other day. I like to think that I’m really on top of Christmas sewing for next year (instead of the truth that I just didn’t get to them this last Christmas). 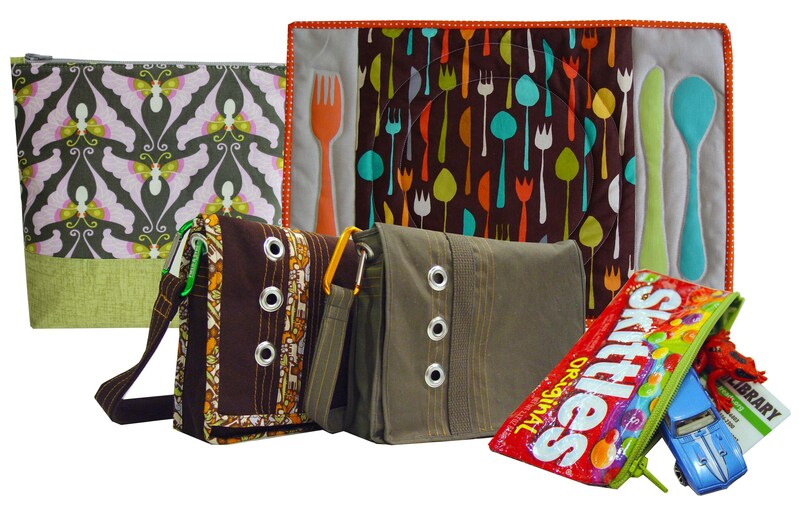 Of course, you can make some great napkins in lots of pretty fabrics — not just holiday themed fabrics. Great post! Who knew even I would learn something about sewing a straight line. I will always remember your tip “butterfly hands”. Love it! Thank you for sharing. what type of fabric is best for the napkins? Quilting Cotton and Linen fabrics (or a mix of them) work really well. Natural fibers absorb liquids/spills best. That’s what I like to use. 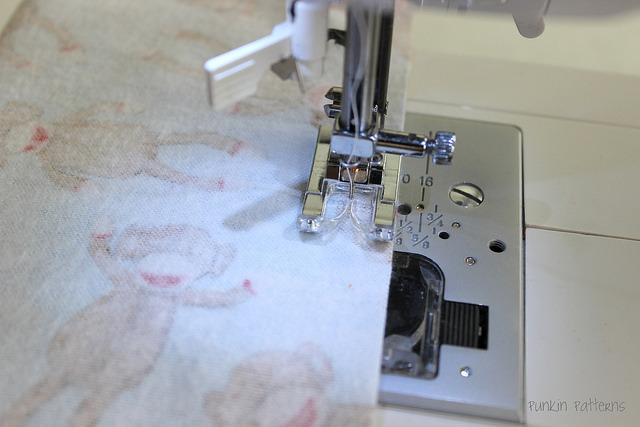 What a precious video of your daughter at her own sewing machine. I can see how she is using her “butterfly” hands.